CarGurus has 22,403 nationwide Forester listings starting at $1,000. With a Top Safety Pick and Best Value under its belt, the Subaru Forester is a great choice in a crossover—especially if you don't care about the latest, greatest tech or the most luxurious interior. The Forester is still fresh off a 2014 redesign that had everyone singing its praises. Motor Trend named it SUV of the Year, and the Insurance Institute for Highway Safety (IIHS) called it out as a Top Safety Pick. I’ve been a Subaru fan for many years and have logged my fair share of miles in Outbacks and WRXs alike, even driving one special example up and down the eastern seaboard. But for this new Forester, I just wasn’t sure what all the fuss was about. After a week with a 2.5i Premium trim, I understand a little better. Available with either an asthmatic or turbocharged boxer 4-cylinder, the Forester follows the traditional design style of Subarus past and offers understated or slightly aggressive versions of the same car, depending on your choice of powertrain. Pick the regular 2.5-liter, and you’ll get a sharp, handsome crossover SUV that really has only aesthetic competition from the Mazda CX-5. Go with the turbo, and you’ll be treated with extra lines and angles that tell everyone you mean business in the way only forced induction can. Regardless of choice, you’ll get a capable crossover that rides like a car, hauls like a truck, and can even drive over a few things if you so choose. The interior is still below par, and the infotainment system is one of the worst in the industry, but otherwise the Forester is a nimble, utilitarian, and—most importantly—very safe option in the segment. For my week with the Forester, Subaru provided me with the 2.5i Premium (MSRP $25,095) with the added All-Weather and EyeSight packages for an extra $1,295 ($500 off for 2015), bringing the total to a reasonable $27,439 with delivery ($850) and the auto-dimming mirror with built-in compass ($199). Subaru has come very close to providing a perfect balance of performance and economy with its series of boxer engines, but a few small grievances prevent it from getting top marks. The base 2.5-liter 4-cylinder can be matched with a 6-speed manual or a CVT in the 2.5i and 2.5i Premium, but move above that, and you’re stuck with the uninspired CVT. Not that the manual is perfect, either. The Forester I spent a week with came with the CVT, but I’ve driven the 6-speed as well, and while long throws and slight sloppiness keep it from inclusion on any best-of lists, it’s a great way to wring all the potential power out of the 2.5 and make that anemic engine a bit more fun. But with only 170 hp and 174 lb-ft of torque, that fun is limited. Sadly this is made even worse with the 6-speed, where higher revs make the engine sound like it's really struggling. Harsh is the word here, and that’s a big penalty to pay when it takes 9 seconds to get to 60 mph. But on the bright side, the CVT will reward you with 24 mpg city/32 highway, while the 6-speed can manage only 22/29. 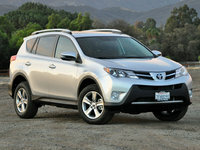 For more power, the turbocharged 2.0XT comes with a 250-hp 2.0-liter engine with 258 lb-ft of torque. 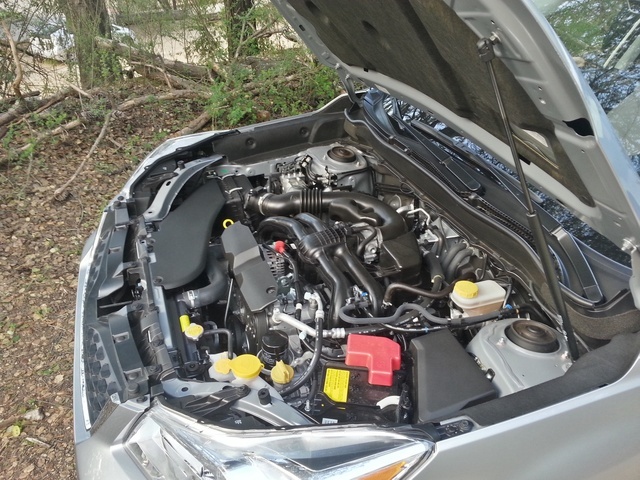 Even with the lackluster CVT, this engine provides plenty of power and can motivate the 3,300-pound Forester to 60 mph in just over 6 seconds. 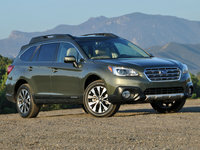 Sadly, it has a relatively low tow rating of just 1,500 pounds, a figure shared with the base Forester. But it doesn’t come with the expected fuel penalty and still manages a claimed 23/28 rating, though those numbers have been difficult to reproduce in real-world testing. My time with the Forester failed to replicate its claimed 27 combined rating, and my averages were most often in the lower-to-mid 20s. Still, the Forester offered a nimble, agile suspension that was light enough for city and parking duty yet capable enough to tackle more aggressive terrain. All-wheel drive (AWD) kept things balanced, and the extra length in the wheelbase gained during the last redesign offered a composed ride even at highway speeds. Steering feel isn’t the most engaging in the industry, but I also encountered none of the vagueness or unpredictable modulation I’ve found with other electric setups. The Forester offers a good balance for a reliable family and grocery hauler. When the Forester debuted back in 1997, Subaru was still an underdog offering more performance than most people recognized. Now that Subaru has become synonymous with rally racing, the Forester has actually lost some of that edge. Yet it still remains the competent commuter with some off-road prowess it was always meant to be. Outside, this story is obvious. The current generation looks like someone blended the old Forester with a second-generation Escape—edges are softer, and the profile is somehow more generic. It’s not bad, it’s just not as recognizably Subaru. Inside, the cabin is awash in hard surfaces. The bulk of my time in Subarus was spent in the early 2000s, and this looks only a generation ahead of those plastic landscapes. The fact that so many have praised Subaru for the interior improvements of late only speaks to how bad they used to be. Of particular annoyance was a persistent rattle coming from the panoramic moonroof, situated frustratingly above my right ear. That said, it was a problem Subaru was eager to fix, and I absolutely love all the extra light you get inside with this feature. It's a must-have option in my opinion. Faux aluminum accents are made worse with a “brushed applique” added to the door handles, and I worry about wear. A nice steering wheel is only slightly crowded with too many buttons, but it’s nice to look through the gap to see a simple, dual-gauge setup with a single info screen in the middle. Switches are nicely damped if a bit outdated, especially on the stereo, which is perhaps the worst offender of the “looks like it was sourced from a 10-year-old parts bin” group. Seats look quite nice and fold flat in the rear with a one-touch mechanism for a full 68.5 cubic feet of space (74.7 in trims without the panoramic moonroof), but tend to feel a bit flat, especially if you try and test the AWD with some spirited cornering. Leg bolsters are the big issue here, as they squish like an overripe avocado rather than supporting like a compassionate spouse. That said, they weren’t uncomfortable and handled longer rides without fatigue. 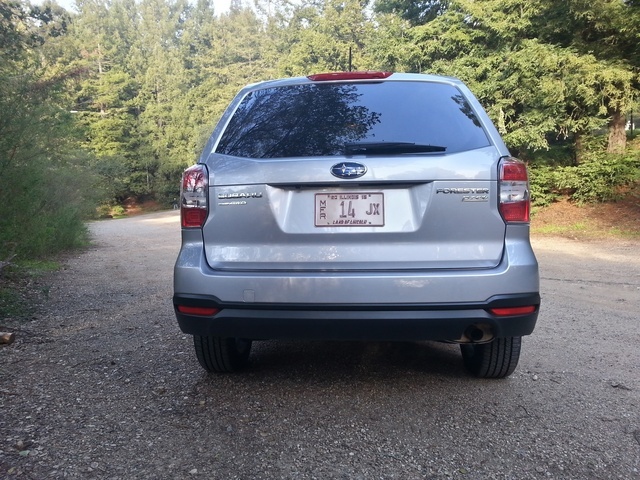 Tech is one area where the Forester truly lags behind the competition. While every Forester now comes with a standard backup camera—just added for 2015—the screen on which it displays is one of the smallest, lowest-resolution setups in the industry at 4.3 inches. The sight of it in the dashboard was almost comical to some passengers, who likened it to the postage-stamp screens seen on old console televisions. The optional navigation system is $1,100 on top of the mandatory All-Weather and EyeSight packages ($1,295), and it’s simply dreadful. Luckily you don’t have to buy it, and even better, my example didn’t come with it, but I have been frustrated by this system in the past. If you do check the box, you’ll get a 6.1-inch touchscreen slotted into the stereo space, and you’ll spend most of your time cursing at its lag and poor resolution. However I did get to test out the EyeSight system, which was included here (at a $500 discount for 2015) along with the All-Weather Package. It adds driver safety aids like pre-collision braking, adaptive cruise, lane-departure and sway warnings, as well as a pre-collision throttle-management system, all designed to prevent an accident before it happens. 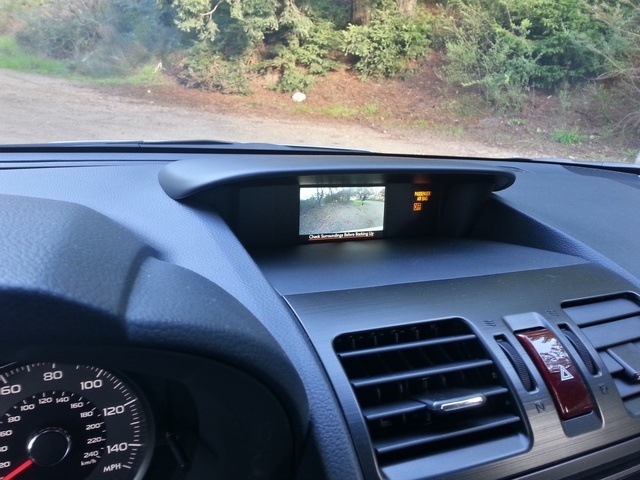 Subaru warns that this is an optical rather than a radar system, utilizing 2 cameras on the back of the rear-view mirror. Because of this, low-visibility situations may cause the system to disengage—things like fog, snow, rain—basically the times you’d need it most. I didn’t encounter a lot of that driving around Oakland, but the system frequently shut off in direct sunlight during my week with the Forester, and that just seems unforgivable. So basically you’re left with a system you can rely on only during cloudy days where it’s not foggy, raining, or snowing. There are other little issues as well, some more confusing than frustrating. There’s an SD-card slot, but it can be used only for providing the navigation system with map data. Why even include it? You can get satellite radio, but the screen won’t display a list of the stations you can select. Strange. If there’s one area in which the Forester excels, it’s safety. An IIHS Top Pick, the Forester delivers standard safety features like Surabu's lauded symmetrical AWD system, antilock discs, traction and stability control, and an impressive list of airbags including front pelvis/torso, side-curtain, and driver's knee airbags. Add the EyeSight system and you’ll get all the avoidance features mentioned above, with the braking system getting special recognition from the IIHS with a rating of Superior. The National Highway Traffic Safety Administration had similar things to say, awarding the Forester a 5-star rating, with only front impacts getting a 4-star score. Braking distance from 60 mph is average for the class, floating between 120-125 feet depending on trim, and honestly a figure I’d like to see Subaru (and all manufacturers) concentrate on dropping in the future. Let me start by saying this, because it warrants mentioning: Kelley Blue Book has named Subaru the brand with the highest resale value and lowest cost to own for 2015. 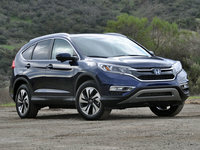 Among competitors, pricing is right in line with that of the Escape, CX-5, and CR-V. The CX-5 and the Escape offer a more engaging ride, though you’ll have to pay a little extra for AWD. But you’ll also get better mileage with the CX-5 and the CR-V, and much better tech and interiors in anything you choose. With that in mind, it’s really going to come down to feel. Some people still aren’t used to the unique character of a boxer engine, so drive them all and see which seems most livable to you. 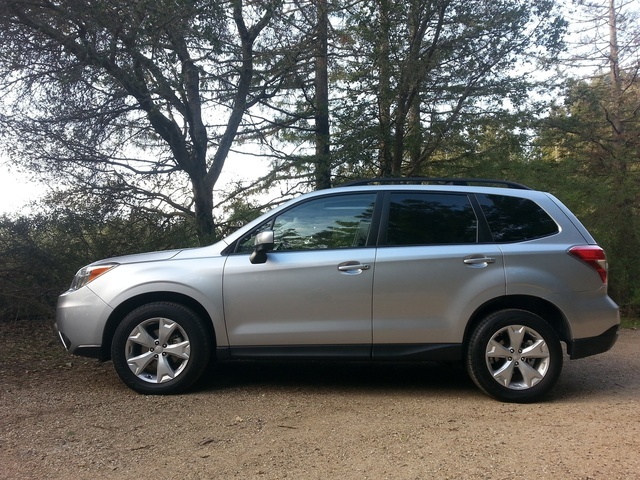 What's your take on the 2015 Subaru Forester? Displaying 1 - 10 reviews out of 16. 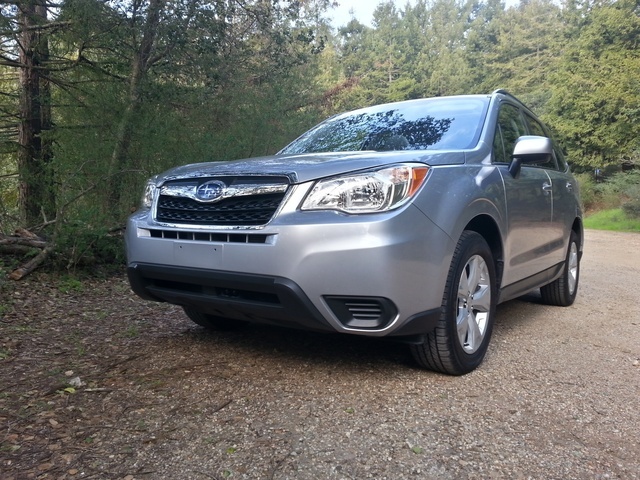 Loren I have been checking out the 2014 and 2015 Subaru Forester Limited. The BOX engine and the AWD are unkown territory for me. Can any owners out there enlighten me on the pros and cons of owning a Subaru SUV ? It is a big step for my Wife and i, since we are retired and on a fixed income, and plan on our vehicle to last many years . Bonnie Loren, we have a 2003 Outback with 192,000 miles on it and are ready to update to a 2015 Forester. I absolutely love my Outback and hate to see it go, but it is time. I have test driven the Forester and it feels very similar to my Outback. It has good power and great visibilty (I am vertically challenged so this is a concern of mine). The AWD Subaru handles beautifully on the road and in bad weather. We too are retired and on an fixed income, but believe me, you will be making a wise choice. Gwermter We purchased a 2015 subaru forester thinking we would use it to pull a small trailer. A few things reared only after we purchased the car. The four wheel drive breaking takes away from the front brakes working harder than the rear, thus you have to push much harder on the pedal to stop the vehicle. The auto trans is a mess under load conditions the engine rpm's soar too high. Subaru limits them to 6000 internally. When the engine is new the engine will survive but, as it ages good luck!!! As a real kick the sales department will get you to sign a paper to get you to agree not to take any problems to court to get justice, but agree to have outside people to solve problems. I found whatever problems come up, they are totally normal and acceptable for thes cars. 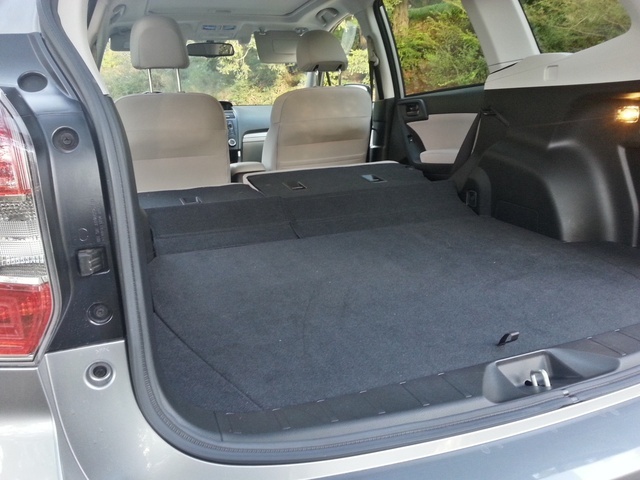 4me2now Bought the 2015 XT Touring Forester with all the bells & whistles back in May '14. Can't add a whole lot of difference to the reviewers and all seems to be true. WOW, what a really FUN car to drive , they should have named this one ZOOMBARU as the slightest foot on the gas puts you ahead of the rest ( with much stability I might add) and good comfort . Did not feel I needed the eye sight, GPS big screen, as felt this is already outdated . Phones, I-pads, have all the features you could want from navigation device so opted to get that great high end harmon Karman Stereo. With that wonderfully big sunroof & sounds a blaring , I like to go for rides to no-where. As has already been brought out in reviews, big main problem is with the MPG which never seems to come close to what was suggested no matter where or how I drive. Given that you really have to put the 93 Supream in this baby for top performance, for now can be happy gas prises are very low. All in all, LOVE MY ZOOMBARU! F_O_R Before you buy a new Subaru look into the oil consumption issue. Yussel1 The GPS is a total disaster. It is NOT user friendly and it needs GOOGLEIZATION. The Screen controls on the touch screen need updating and the telephone software is outdated. Conclusion....it came in my package with the $40K vehicle but I use my Android with Google Maps. Displaying 11 - 16 reviews out of 16.
tameling We just rented a 2015 Forester for 2 weeks in Colorado. This model had the sunroof and heated seats, but no Navi. The car performed well on highway and graded gravel roads. The large windows and interior space was excellent. But we would never buy this car. The tailgate squeaked and rattled the entire time, which is beyond annoying. The tiny central display on the dash was impossible to read on a sunny day and the cheap radio display was also washed out. The stock stereo system was mediocre and frustrating to adjust; looked and functioned like a $99 in dash unit. 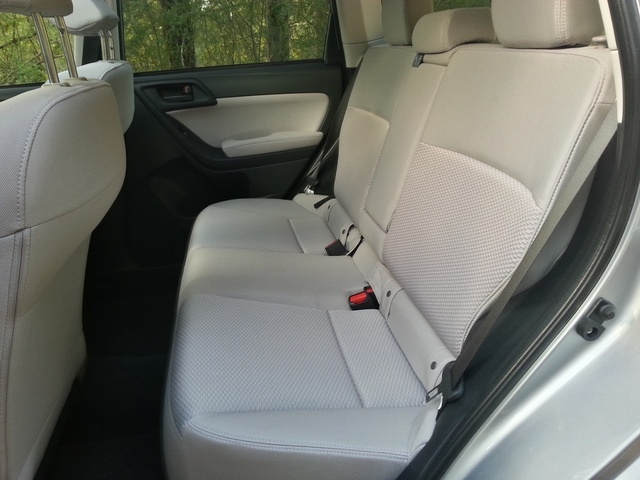 There was no lumbar adjustment for the passenger seat, and the passenger manual recline adjustments are crude and frustrating to manipulate using the cheap plastic handle. As a concept, the Forester has great promise, but this model is a cheaped out transitional model that I would avoid until they fix the rattles and junky hardware. Rogerdoger1 I am considering buying a 2016 Forester 2i Limited. The CVT performance in a heavy snow area of Minnesota is my concern. Any opinion from current owners who've dealt with this type of driving conditions? Milesb72 Anybody have the 2015 Forester with the all weather package. Just tested the windshield wiper heater today and it performed quite poorly. Side view mirrors didn't do a great job thawing ice either. Steve I can't believe this car was only give a 4 for tech! The AWD in Subarus alone warrant a better rating than that. Plus, this car has the Eyesight technology that allows the car to break and accelerate while in cruise control. The car practically drives iteself, and also has things like lane sensors and obstruction warnings. Excellent car. The only complaint I have is that it lacks in getup and go, and the synthetic seats are extremely hard to get clean. minneapolis I have a 2015 XT premium, and just put it through the ringer in the Canadian Rockies. It preformed great using the Sport sharp option and paddle shifters on the steep mountain roads and off road trails. It gets great mileage, about 26-27 through the highway and city. The bluetooth system could be better, but overall it's a great car. Littleterribull I’ve had my 2015 Subaru Forester For a week now and my only objection thus far is the lack of auto headlight function, no remote start and annoying passenger seat belt light that never goes off. Otherwise it fits like a glove! Users ranked 2015 Subaru Forester against other cars which they drove/owned. Each ranking was based on 9 categories. Here is the summary of top rankings. 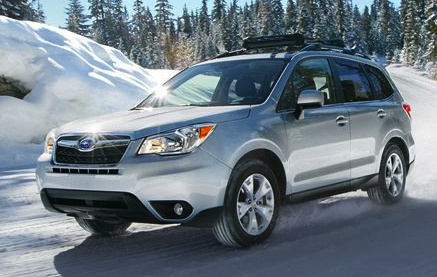 Have you driven a 2015 Subaru Forester? Subaru Forester AC Quits When Idling. Radio Won't Work In 2015 Forrester After Battery Died And Was Recharged. The battery went dead in my 2015 Subaru Forrester. We charged it with our home charger but now the radio won't turn on. It was fine before the battery died. How can I fix this.